Democrats Illegally Subverting the Constitution to Destroy the Electoral College – Guaranteeing There Will NEVER be a Republican President Again! – I Am Not Ashamed Of The Gospel Of Christ! Home › Censoring of truth › Democrats Illegally Subverting the Constitution to Destroy the Electoral College – Guaranteeing There Will NEVER be a Republican President Again! (True Conservative Pundit) There is no rule the Democrats won’t break, no law that will not be subverted, and the U.S. Constitution means absolutely nothing to these oath-breaking law-breakers. Have you heard of the National Popular Vote Interstate Compact? This is serious business of the highest magnitude. The National Popular Vote Interstate Compact (NPVIC) is an associated group of eleven states and the District of Columbia – with one goal in mind, destroying the Electoral College. Instead of the Electoral College, which was set up via the Constitution by the way, presidential elections would be decided by the popular vote instead. These states that belong to the compact have decided that their states votes would all go to whoever wins the popular vote. Ten more states have legislation pending to join the NPVIC. This groups plans will be implemented when the members of said group reach a total of 270 electoral votes, the number needed to win the presidential election. Deciding presidential elections via the popular vote sounds ok right, so why not do it? Democrats support this measure whole-heartedly – and that should give one cause for suspicion and extreme caution. Apparently a large swath of the country also thinks that a popular vote is the way to go. President Trump himself stated that he was in favor of a popular vote – this author will tell you that this was and is a very bad idea and foolish on Trump’s part to say it’s a good idea. Maybe President Trump forgot that if the 2016 election were decided by popular vote – Hillary Rodham Clinton would be the president of the United States today and not Trump! So how does the Electoral College work and why use it? Basically the simple explanation is that the Electoral College makes the vote much more fair, so that everyone throughout the U.S. has a say in the presidential election results. Without the Electoral College – most of the U.S. would have NO say at all. Based on the above information, states like California, Texas, Florida and New York are huge prizes in a presidential election as they have the highest numbers of electoral votes. The number of representatives each state has serving in the House of Representatives is determined by that particular states population count. Therefore, a higher state population equals more electoral votes for that state. Lets look at the popular vote map for the 2016 presidential election. Notice anything about the above map? RED represents the votes for Donald Trump. BLUE represents the votes for Hillary Clinton. 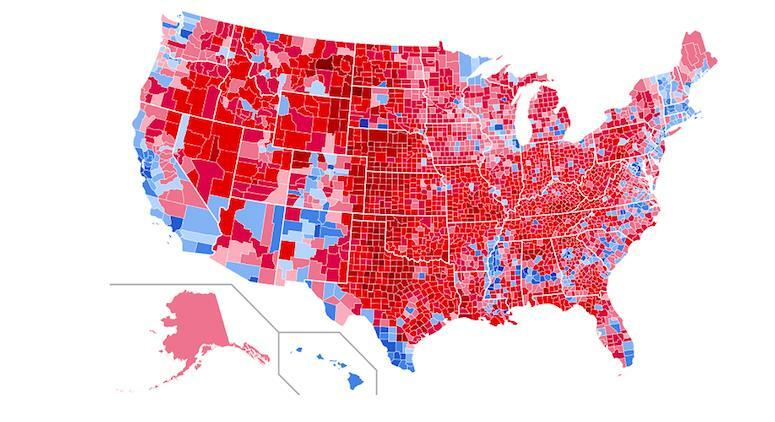 Here is the problem – looking at the map, it is quite obvious that Trump consistently won counties all across the entire U.S., very little of this map is blue. That being said, the blue areas being won by Hillary – totaled up to over 2 million more votes for Hillary than for Trump. So, the even bigger problem here is that if the Democrats succeed in this diabolical plan of theirs to dismantle the Electoral College – the votes of a few states will determine the presidency instead of the votes of a majority of the states. The Democrats are very well aware of this, which is why they are fighting hard to get rid of the Electoral College. Even though the vast majority of counties all across the U.S. voted for Trump, by the popular vote count, Hillary would have won the 2016 presidential election even though Hillary won very few counties compared to the counties Trump won in the U.S. So basically – even though Hillary won the popular vote, which again means that Hillary received the most votes nation wide, that vote is not at all representative of how the voters voted nation wide. Again, look at the above voting map by county, who won most of ALL the counties in the entire U.S.? Donald Trump did – and yet, if the Electoral College were to be done away with, Hillary would have won. There is a reason the Founding Fathers set things up this way, it’s called fairness, it s also called ensuring the entire nation has a voice in the presidential election. Since the most populous states are hard-core liberal strongholds, if the Electoral College is overturned, be it legally or illegally – there will NEVER be another Republican president. If this happens, the majority of the United States will NOT have a say in the presidential elections any longer. This is only my opinion, but I think that if the American people truly understood how the Electoral College works and the way that it protects their say in the presidential elections – this attempt at subverting and destroying the Electoral College would come to a screeching halt.